Part of the publishing process for my new book HOME IS WHERE THE BARK IS (on sale July 6, 2010) is checking page proofs, the final opportunity to correct errors before the book is printed. 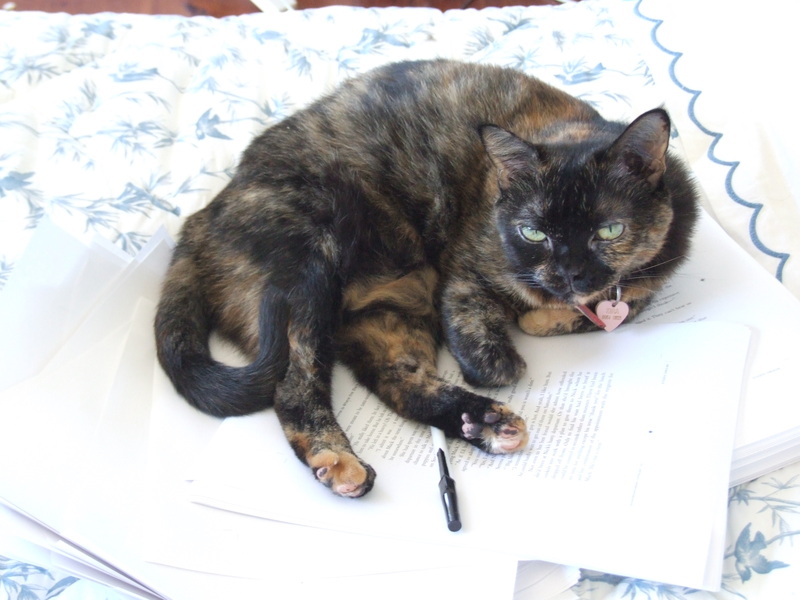 My tortoishell Tabitha was determined to “help”–or is that expression on her kitty face reprimanding me for writing canine rather than feline characters? More likely, she’s just demanding attention–after all, how could pieces of paper be more deserving of attention than she is? Whatever, I think she looks very cute reclining on the proofs and she got lots of cuddles for being so cooperative for the camera. 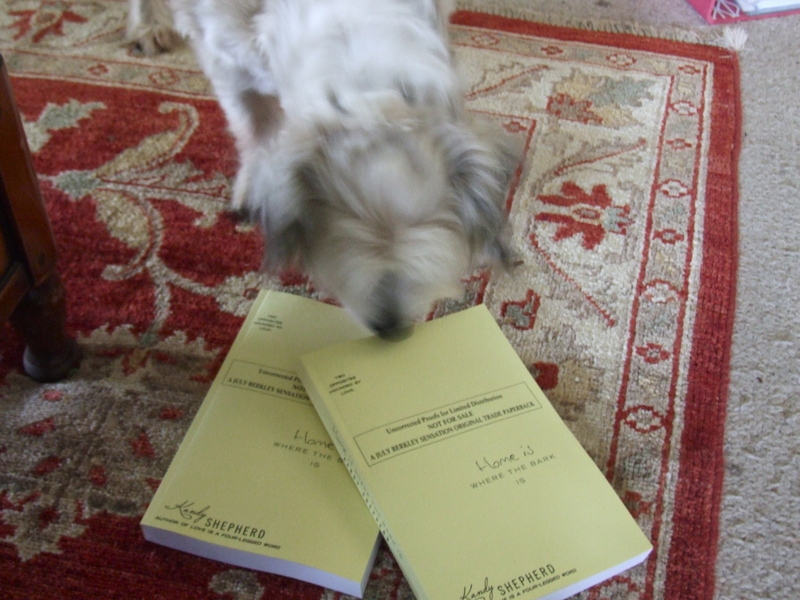 So I tried to get Miss Molly into the act when it came to admiring the ARCs (the advance review copies my publisher Berkley sends out to reviewers). 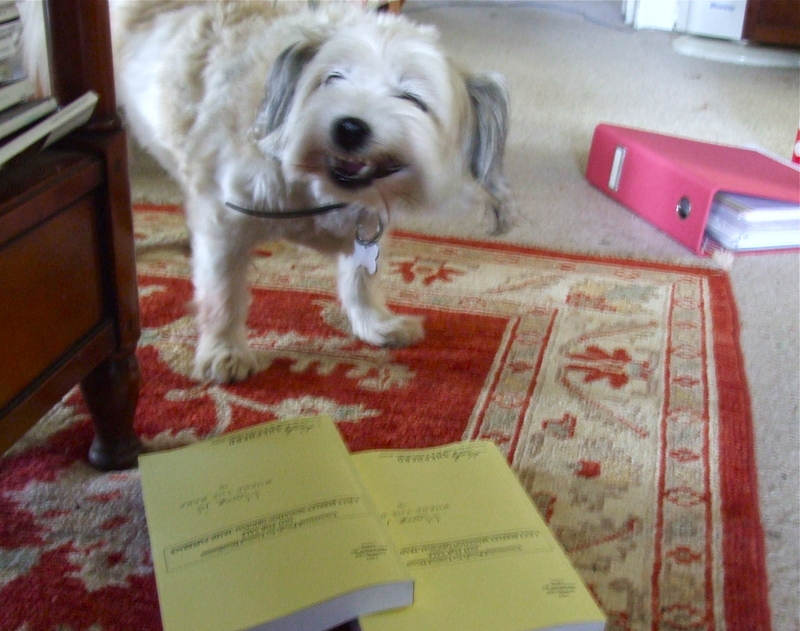 Only a judicious scattering of dog treats near–but not too near–the books got the desired effect. I wanted her to look as though she was “reading” the cover, but I also didn’t want doggy drool all over the covers of my copies! Are there doggy characters in this new book? She was nowhere as cooperative as Tabby–the demands for treats escalated as I tried to photograph her– but wasn’t it worth it for that doggy smile of approval? HOME IS WHERE THE BARK IS is meant to be humorous (it’s the follow up to LOVE IS A FOUR-LEGGED WORD) and Miss Molly looks like she gets the joke! I hope readers share her opinion when the book goes on sale!